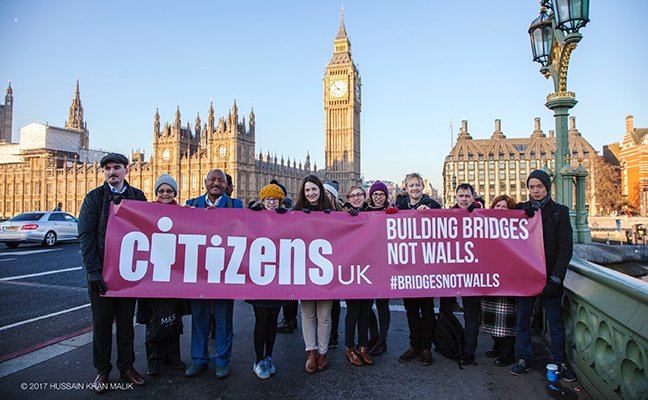 Citizens UK is a charity led by its member institutions – a diverse alliance of civic institutions such as churches, mosques, schools and community groups. Our alliance represents hundreds of thousands of people, from South London to Wales and Newcastle. Together, we organise our communities to act for power, social justice and the common good. We do this by developing the leadership capacity of our members to participate in public life and win victories that change lives and transform communities. Our work is based on the idea that democracy works best when civil society is at its heart: making sure that communities are at the negotiating table to shape the decisions that affect us and holding both the market and the State to account. • We spearheaded the movement for a real Living Wage, which has seen thousands of the lowest paid workers earn wages that meet the cost of living. • We ended the cruel detention of children in deportation centres and seen off exploitative loan sharks. • We set up hundreds of refugee welcome groups that lobbied their local councils and ensured that Syrian refugee families could find sanctuary in the UK – and we’re pioneering ‘community sponsorship’, a new type of refugee resettlement.